We’ve all seen the typical class schedule available for purchase. Or the classroom white/black board taped off into sections for the daily schedule to be written out. 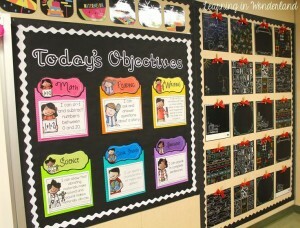 However, if you’re looking for a more creative way to display your daily class schedule, while also saving precious board space, then check out these wonderful ideas! Here is why this is so wonderful! 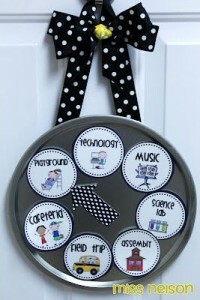 It’s 100% DIY, and can be placed and moved around anywhere in your classroom. Make it as big or as small as you want it. All you’ll need to do is: buy a round lightweight baking tray, print/draw labels, cut them out and laminate them, then attach magnet tape to the back, and voila! I also love the addition of the arrow, to keep students on track of where they are in the day. If you’re really crafty, you could even make this into a clock, so that your students can see the time of day alongside the class topics. Another great DIY project. 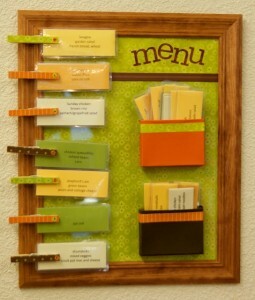 Now, I know this says menu, but wouldn’t it be wonderful as a class schedule? All you’ll need to do is: buy a colorful frame and decorative clothes pins, create a vibrant background for the frame, and course cards with colorful bold print and maybe some pictures. This is a cool new way to display your class’ day! This one is so beneficial for your students because it ties in both a scheduling component and daily objectives, which will really set your students up for success. This specific set of objectives can be found here, or you can pair other images with specific goals you’ve written up. Better yet, I say print blank subject cards (such as math, science, etc), laminate them and write your own objectives day to day with erasable marker. This works nicely if you’ve got some extra wall space. I like this idea because the creativity is all yours. You can follow this example with the clothes pins, or you can create a giant class clock with subject cards, the possibilities are great with this one. You can also change up the decorations based on seasons and holidays. 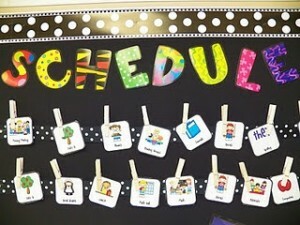 What is your favorite way to display your class schedule? Probability Game Ideas – Have Fun With Math!